If you ‘fish’ an autographed copy direct from S. Amaranthine, please send e-mail request to: author@samaranthine.com for more information (allow 48 hours for reply). Book 2 in the series. To be read and re-read! Great for beach or a long, comfy curl-up. Cetapiens is the sequel to The Vencello. 4.3 stars from Indie Reader! 4.5 stars from Serious Reading! 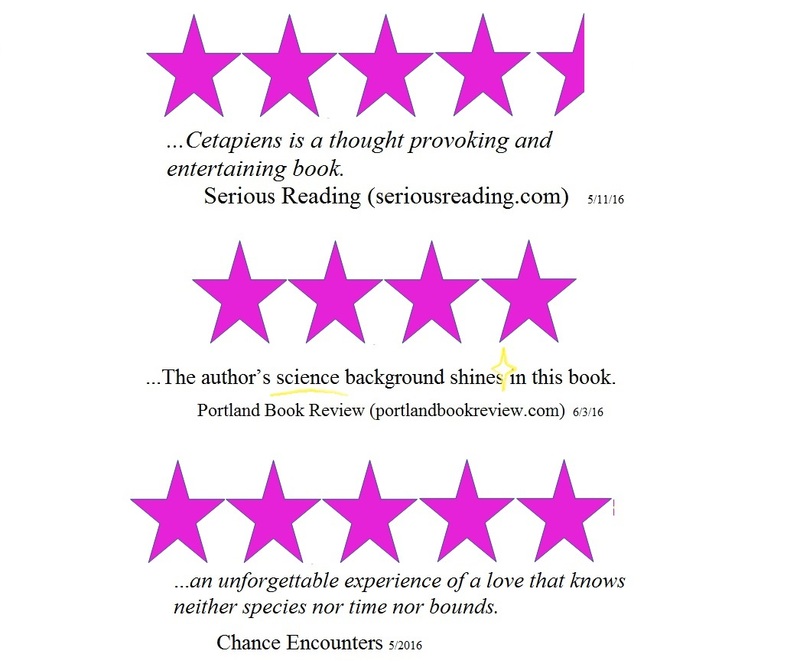 4 stars from Portland Book Review! This is one of the most original books I’ve read in some time! Part sci-fi, part saga, the story in Cetapiens picks up where book 1 of this trilogy, The Vencello, left off. Cetapiens’ protagonists include humans and sea animals, each with their own voice and perspective. This is a fact that will no doubt be front and center in many reviews, and I am completely fascinated by the way author S Amaranthine has so creatively informed the communication style of each character with what we know and/or believe about each species. But don’t think this is a simple “talking animals” story. There is no “magic” happening here. And that’s what makes it so amazing. I hesitate to review the content of the story, because doing so would most certainly lead to discourse on the concepts of time, space, identity, values, and existence – topics best saved for book club discussion! I will say that Cetapiens does not want for ideas! As you begin reading keep in mind that some of the ideas in Cetapiens are complex, and quite a bit of science comes into play. I confess that about one-third of the way in I was overwhelmed enough by the unfamiliar language to have to put it aside for a couple of weeks (I am not a “science” person!). That said, although I was encouraged to “push through” the confusing parts, I decided to start over and found that it all started clicking for me! It is not a “quick read”, but I wasn’t able to put it down! At this writing, I am already planning to reread Vencello and Cetapiens to be able to more coherently discuss it’s themes. This isn’t something that I ever do, and I’m looking forward to it! Having read S. Amaranthine’s first book, The Vencello, Cetapiens was a revelation in more ways than one. The story created in The Vencello now departs from a traditional fiction narrative and becomes a multi-stage exploration of different life forms and their experience of the multiverse. Part redemption story, part time travel, part commentary on our treatment of wildlife and the environment, and part theory of how humans might have evolved differently, this isn’t a quick read, but it’s well worth the journey. If you have any interest in sea life, the multiverse, time travel, and especially how multiple advanced life forms can live in harmony, get ready for a truly unique and enjoyable story! And don’t miss S. Amaranthine’s playlist for Cetapiens, available on her website. The haunting and compelling music combined with the author’s inventive and thoughtful prose creates an unforgettable experience of a love that knows neither species nor time nor bounds. IR Verdict: CETAPIENS is a story that relies heavily on surrealism and abstract concepts to tell a larger narrative that spans multiple planes of reality to tell a story about life, evolution, and the persistence of love through it all, in a clear narrative lifeline. CETAPIENS by S. Amaranthine is the second novel of a trilogy dealing with large-scale science fiction and fantasy concepts in a non-linear narrative that encompasses multiple planes of existence. Unlike THE VENCELLO, the first book in this series, this narrative follows multiple characters, some of whom are amalgams of other characters, as well as characters existing in multiple universes at the same time. One of those universes is called “Cetapiens,” because it is a universe combined with cetaceans and homo sapiens. To draw a comparison, not to other prose but to television, THE VENCELLO is to CETAPIENS what the original run of Twin Peaks is to the recent revival of the series airing on Showtime. One is a straightforward narrative with fantastical elements hinting at a deeper mythos. The sequels, however, are more a collection of images and concepts from which a dedicated audience can glean details about both the narrative and the wider mythology. The two works share a similarity of theme, at least when it comes to doppelgangers, different dimensions, and the ability of people in one dimension to perceive the other. CETAPIENS may be a challenge for readers, especially since Amaranthine creates an entire vocabulary to help tell the story. She includes a glossary of fictional terms, though the concepts are defined much more clearly in the context of the story. For example, in the glossary Amaranthine defines a “gemini” (or the twin) of a being alive in one universe existing in another. A confusing concept, no doubt, but one best described, not in the glossary, but rather in a scene that that revisits the climax of the first book. The concept of time-travel–introduced in the first book, as well, but only in the abstract–also plays a big role here and we revisit a number of scenes, including the deaths of a human character and an Orca character multiple times. It’s actually a fun twist Amaranthine employs on the common time-travel trope of revisiting key moments in time, but seen from multiple angles. It’s reminiscent of the finale of Harry Potter and the Prisoner of Azkaban, but the fairy-story about a wizard school’s version of time travel is far less complex than what we find in CETAPIENS. Still, despite all of the confusing concepts throughout, Amaranthine does a wonderful job of keeping a clear narrative lifeline throughout the story. Whereas in THE VENCELLO our narrator was omniscient, Amaranthine ties the point-of-view to specific characters. This helps readers keep the storylines straight. While it’s tough to envision what a person who is also an entire universe might look and sound like, we are never lost about what they want or the purpose they serve in our characters’ journeys. Cetapiens is a science fiction novel by S. Amaranthine. A graduate in Health Education and Psychology, Amaranthine is a science fiction and fantasy author. Amaranthine befriended two cetaceans during while he was a university undergraduate. Amaranthine dedicated his first series to his two cetacean friends. Cetapiens is the second part of this trilogy and was published in March 2016. In more than one way, Cetapiens is a revelation. The first book in the trilogy, Vencello was a traditional science fiction novel. However, Cetapiens takes a massive departure from that narrative. This book explores the different forms of life that exist and their experiences. The book narrates many different things including human evolution, treatment of the environment and wildlife, time travel and redemption. The book makes a journey through many different worlds. You’ll find this book truly unique and enjoyable if you have an interest in how different life forms live in harmony, time travel, the multiverse, and sea life. The book also features a playlist for Cetapiens which is also available on Amaranthine’s website. Cetapiens picks up from where the first book in the trilogy, Vencello left off. S. Amaranthine teases readers about time travel in the first book. In Cetapiens, time travel actually takes place. The book takes you on an epic journey—you’ll travel through time into ancient times and universes yet to be discovered. The book will keep you hooked on till the end and when it does finally end, you’ll be craving for more. When you read the book, you’ll often feel as if a haunting and compelling music is playing in the background. An unforgettable experience that transcends all boundaries of time, love, and species is what this book offers you. Cetapiens is a thought provoking and entertaining book. Cetapiens, by S. Amaranthine, is the follow-up to The Vencello. Cetapiens begins and the ability to time travel has become a reality. The ties between the orca and humans strengthen, and with the help of the ocean creatures from the multiverse they help prepare each other for the journey to save many ocean species from extinction with expression of love as the key. This is definitely a book you have to be completely dedicated and engaged with in order to understand what is truly going on, and having read The Vencello is recommended in order to not be completely lost. The story is well written but very confusing at times. The descriptions of time travel are fluid and descriptive. The author’s science background shines in this book. The narration gives off an ambiance of silently floating underwater at times while others can be compared to falling through a colorful wormhole. So much goes on in this story; it is quite hard to truly figure out where everything ties together and if certain events truly occurred, and in what universe. The point of view changes between the different perspectives of the characters, which gives you a better window of what they are thinking about and their emotions. 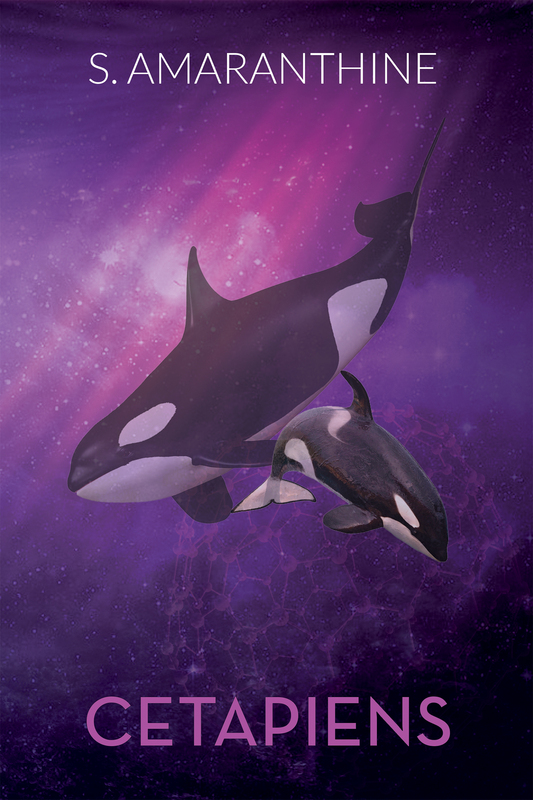 Many scenes such as the deaths of Delora’s son and the orca mother Akenehi’s son are revisited several times, hashing out the different perspectives of what life and death truly means for each creature. Gemini duplications take up the lives that the other characters leave in order to travel through the multiverse. This sometimes becomes confusing to shuffle the information and timelines. The dialog between characters is smooth and natural sounding and the storyline, though confusing at times, still kept with the main focus of the story. The author does offer a glossary of fictional terms at the end of the book, which if read prior may help keep things more clear, and each chapter is titled by the name of the chapter, the universe the scene takes place, and the characters involved. The editing is spectacular with no visible grammar errors. Overall, the story is well written but can be confusing. The descriptive narrative is beautifully whimsical in description. The story itself was captivating but some readers may find it difficult to follow. Cetapiens will leave the reader to wonder what is in store for the final book.